Chinese New Year was a wonderful, wonderful experience here in Aberdeen. Last Year I remember the work really slowing down when the New Year rolled around but this year it was different, it did not seem to have any effect whatsoever other than the positive ones. We decided since everyone would be in their homes why not test our luck with knocking doors! What came of it was the greatest success I have ever seen from knocking doors. We ended up teaching a total of 3 lessons between 3 visits heading over there. 2 were to Chinese people one was to a Philipina who helped us understand that her employer (who was not home any time we visited) had actually been taught previously by missionaries and has a book of mormon. The two Chinese people were from the same family. From two different visits to the same house. We also met another man and his daughter which after talking to them for awhile earned their trust and he wants to bring his daughter to english class, we also ran into him later on the bus and he was happy to see us again. I have always love knocking doors because it takes me back to my summer sales experience before my mission. But the Chinese new year seemed to definitely work in favor of our plan because most people were home. We also had the chance to meet with the Kwok family before they headed to mainland to visit some family and we focused on the importance of daily scripture study. We have previously committed them this was mainly just a follow up lesson. She has a really big desire to accept the gospel and we are trying our best to help her in teaching her kids, we will continue teaching the whole family of course but we have been really trying to help her understand that she needs to lead the way for her kids. It was funny she knew we had suitcases and she did not have enough for her and her kids so begged us to use ours, so right now I have one suitcase in mainland china! A member gave us some radish cakes to give out to less actives and investigators and it was a huge help! It gave us a simple excuse to be able to meet up with a few. For example one is a recent Convert Helen who has not come to church in 3 weeks it was an easy way to meet with her to do our part, but mainly the ward has been very good about staying up on all the recent converts right now. It give me great peace if we were to help someone be baptized that the ward would take care of them. The ward is doing great we are still waiting on the ward mission plan, but they have got some other plans they are executing. They are starting a rotating family home evening once a month on Sunday night at the church. Several families will plan and organize it and we can simple bring investigators so we will do our best to support their plans. Its something they came up with to create unity in the ward and provide ways to consistently have something we can bring investigators too. RED POCKETS!! 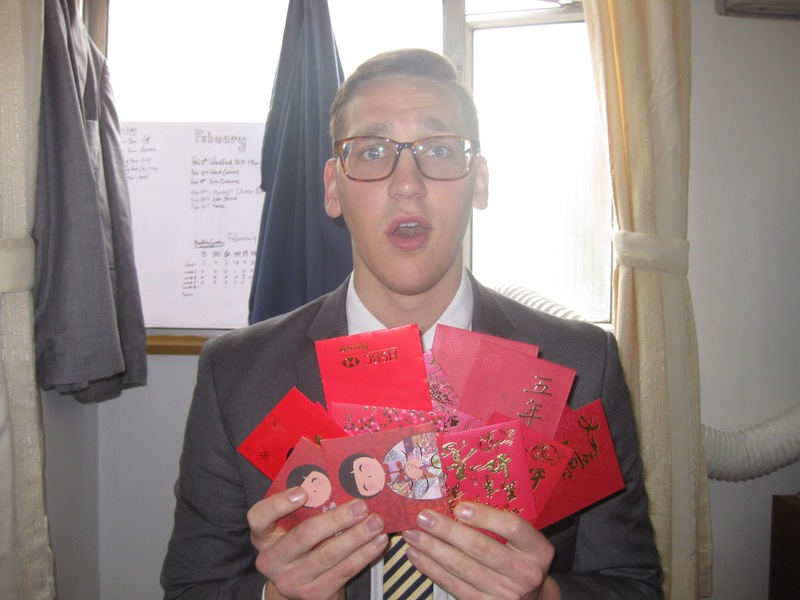 During chinese New year they have a tradition that those who are married will give red pockets to those who are not. Mainly just family and friends. Its basically a red envelope with some cool designs on it and it has money inside! Chinese people love money! yesterday I got quite a bit. I got $380.00 in red pocket money! I love you all and Happy Lunar New Year! 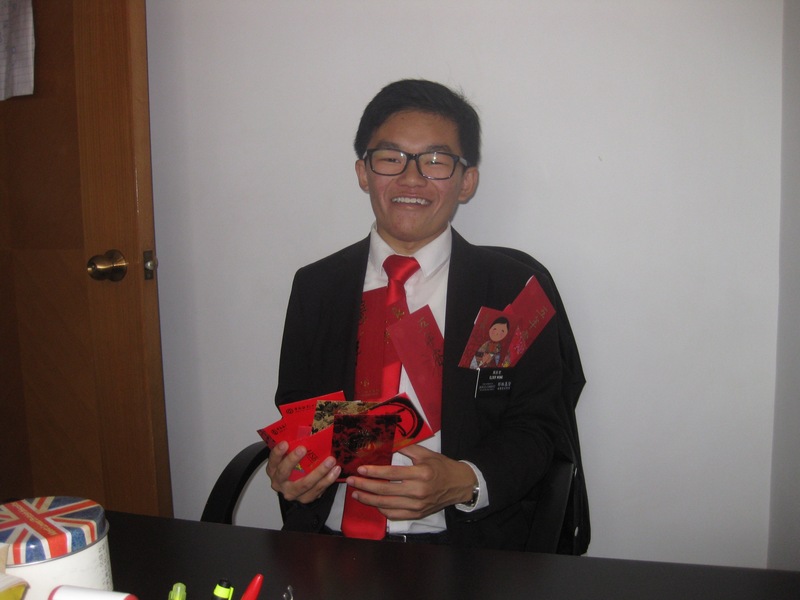 This entry was posted in Jared and tagged chinese new year, Hong Kong, LDS, Missionaries, Mormon, red rockets by shalesecordon9. Bookmark the permalink.